Ever since Pat McGrath launched her brand's permanent collection last year I've been fascinated by its aesthetics, a sort of dark, artsy underground but luxurious visual identity that looks very unique to me. 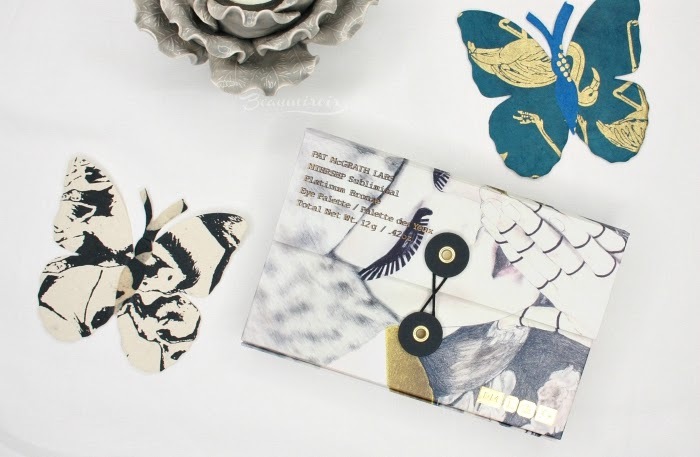 From website to packaging and social media everything is beautiful, cohesive and very appealing. 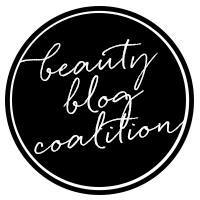 I don't know who the famous makeup artist worked with to launch her line but they all did a fantastic job with the branding. The only reason I hadn't purchased anything from Pat McGrath Labs until now is the high price tags. $125 for the Mothership eyeshadow palettes or $38 for a lipstick? No thanks. But in a smart move the brand released three smaller, 6-pan eyeshadow palettes called MTHRSHP that are a lot more affordable for us commoners at $55. 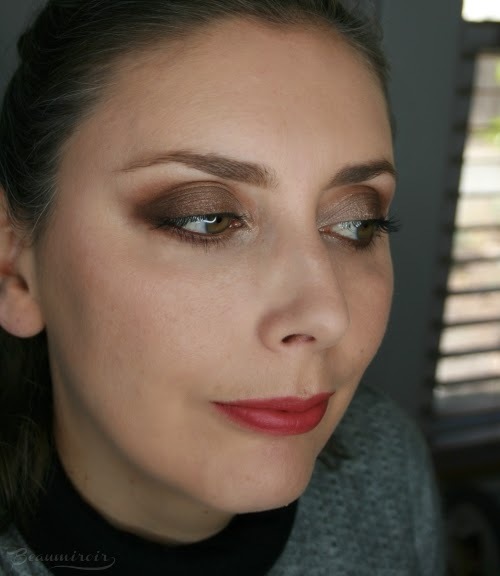 I jumped on the occasion to try the brand's much raved about and supposedly very luxurious eyeshadow formula, grabbing Subliminal, the palette that seemed to have cooler tones. I was genuinely excited to experience Pat McGrath eyeshadows - but are they really worth the hype? Let's find out! First let's talk about the packaging. 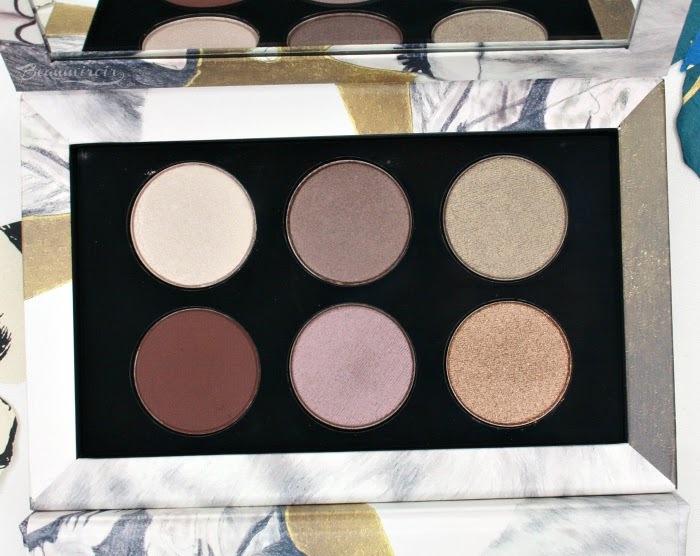 The design of this palette is everything I expected from a brand with such a distinctive identity, and even more. The art is amazing and inspiring, the gold details are gorgeous, and the quality is truly outstanding. 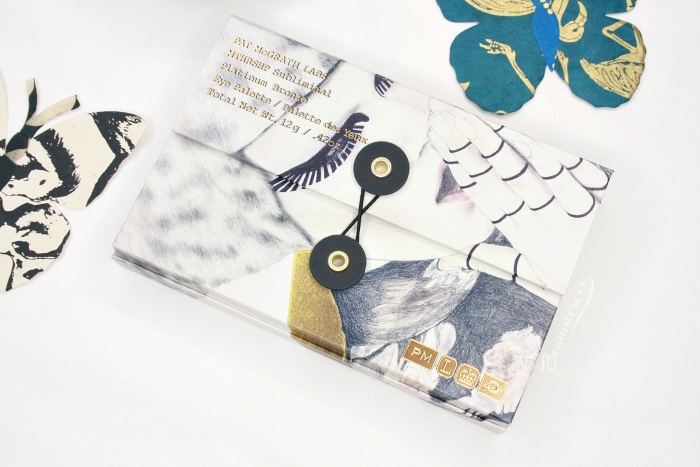 The palette is made of heavy-duty cardboard and opens like a diary to reveal a large mirror. Everything has been carefully thought out and crafted, and it really makes me feel like I'm getting my money's worth! 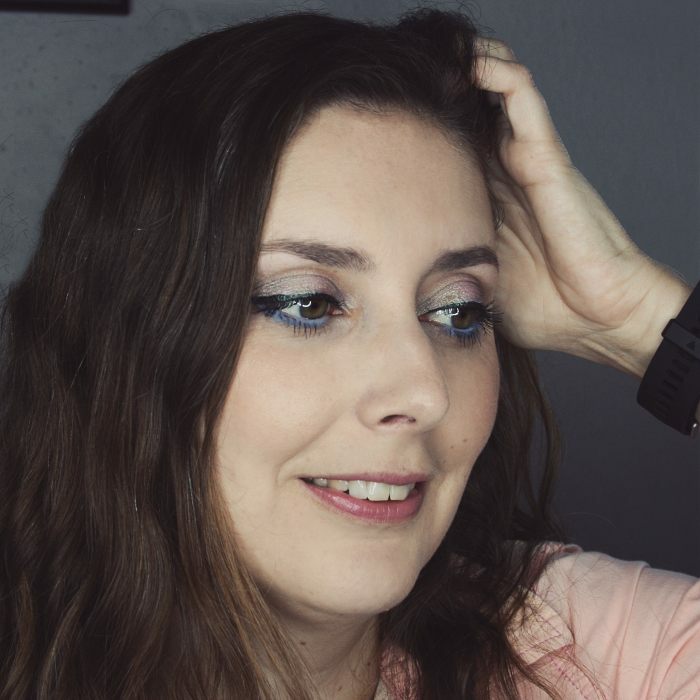 Unfortunately, past the first impression given by the packaging, things went downhill, which I did not expect... A word of warning: I do not use eyeshadows with wet brushes, ever. The technique is just too messy for my taste. I do, however, apply eyeshadows with my fingertips when needed for higher impact and always use a primer. - Platinize is a semi-sheer light beige with a soft sheen. For some reason it looks off-white on my lids, loosing its undertone completely. It's a fine shade to use as a highlight in the inner corner of the eye, but nothing unusual. It feels very creamy to the touch and doesn't cause fallout. - Smoke and Mirrors is probably the best shade in the palette: a rich, buttery dark brown with a hint of mauve undertones and a glowing satin finish. It's intensely pigmented and goes on smoothly. 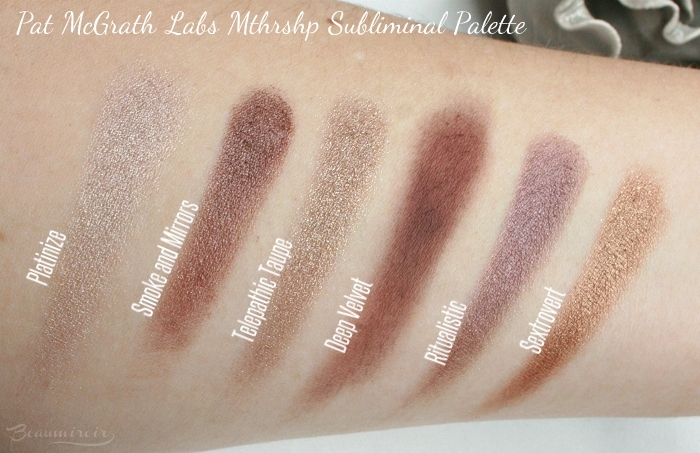 - Telepathic Taupe is the biggest let-down in this palette. It applies as a sheer medium brown with a shimmery finish, nothing like the grayish taupe with subtle green undertones that you'd expect from the pan. This one also feels a little looser with gold shimmer that flies everywhere and causes lots of fallout. It makes it hard to control when applying on the lid, you end up with glitter all over the place. - Deep Velvet is a dark, brownish plum with a matte finish. It swatched patchy but I didn't have issues blending it on the eye. It feels very silky to the touch. - Ritualistic was another major disappointment. In the pan it looks like a luminous and vibrant shimmery purple. It is, in fact, a dull brown with mauve-ish undertones, in a satin finish with a visible sheen, and it causes tons of fallout. - Sextrovert is one of the better shades, a deep bronze with a soft metallic finish. It feels a little chunky to the touch but it applies well without too much fallout. Overall, the Subliminal palette is absolutely not as cool-toned as I expected from the online promotional pictures. It's full of plummy browns, and I would say that the general undertone is more neutral to warm. What really surprised and disappointed me is how the looks I was able to create with this palette lacked luminosity (I've done about 6 different looks). They all ended up being dark and dull, except if I used Sextrovert as the main shade on my lids. I don't mind deep, moody colors but these ones lack the vibrancy and intensity to make them stunning rather than drab. 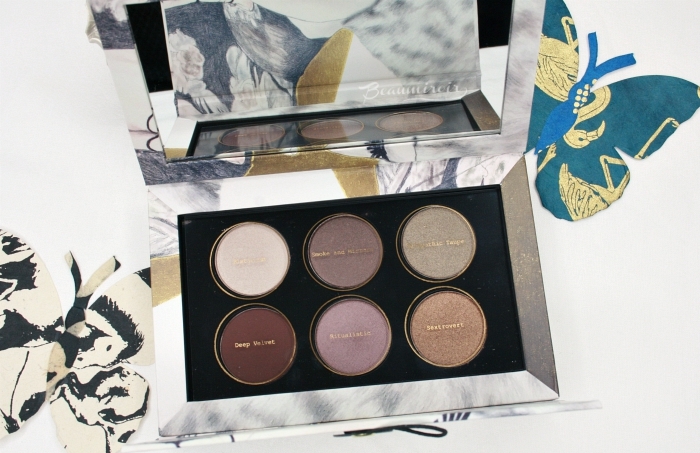 The palette also lacks contrasting colors: Ritualistic and Smoke and Mirrors look extremely similar on the lid, with Deep Velvet also very close in tone. Add to that the fact that the lighter shades are a little weak and the looks turn muddy. I was shocked to see that after painstakingly trying to create a look using 4-5 different shades from the palette, my lids looked like they were covered in one color all over. Using extra matte transition shades from other palettes didn't help much. I hate to be the bearer of bad news but this MTHRSHP Subliminal palette is really not worth the hype surrounding Pat McGrath Labs. It's not horrible - the shadow formula is okay to good - but the color combination is very dull and muddy. It's so far from the vibrant, glimmering shadows I expected from the brand that I'm bitterly disappointed. 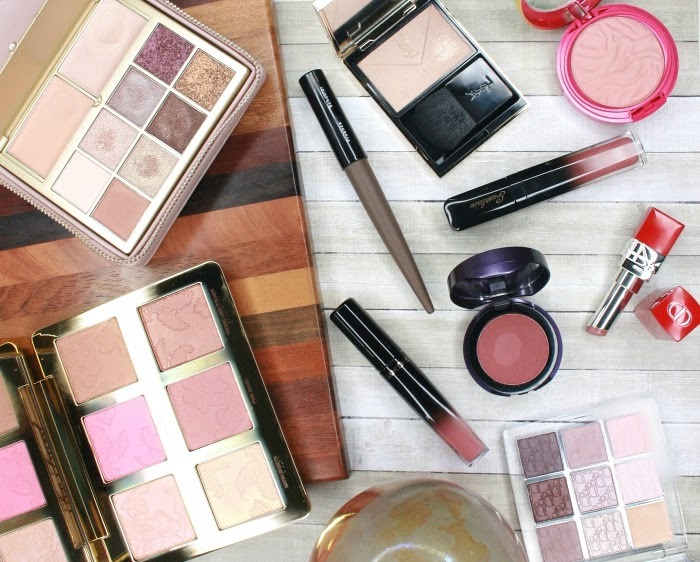 I can't say how it compares to the larger Mothership eyeshadow palettes, or even to the other two MTHRSHP palettes, but this experience did not convince me to try more from the brand!